1. Eight themed sets of Write the Room cards. Each themed set includes three different color coded levelized (below average, average, and above average) sets of write the room cards. Each of these sets consist of 20 cards. The total number of cards for the complete packet is 480 cards. 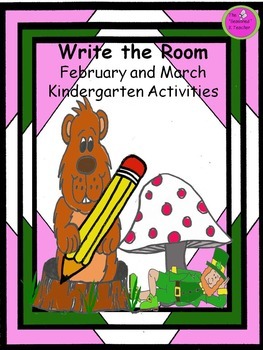 The themes for the cards are as follows: Groundhog’s Day, Valentine’s Day Cupid, President’s Day Flag, Dental Health, Dr. Seuss, Insects, St. Patrick’s Day Leprechaun, and March Lion/Lamb with kite. 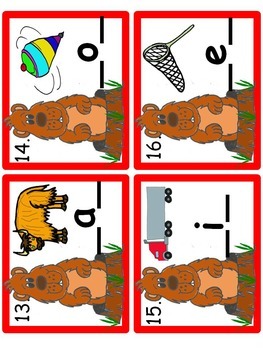 The skills practiced using these cards are writing CVC, CVCC, CCVC, number, color, and sight words. 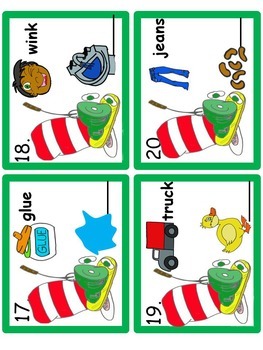 Additionally students are able to practice identifying rhyming picture pairs and writing rhyming words. 2. Recording sheets and answer sheets for each set of cards. 3. A themed picture card for each set to be used with a manila envelope for the storage of each set of cards.